Today's Image of Mars is of Nili Fossae in perspective, as taken by Mars Express Orbiter on Feb 8 2008. Nili Fossae is a graben system on Mars. 'Graben' is the term used to identify the lowered terrain in the area between two parallel faults or fractures. The area collapses when tectonic forces pull the area apart. Nili Fossae contains many grabens and is located "northeast of the Syrtis Major volcanic province, on the northwestern edge of the giant Isidis impact basin." 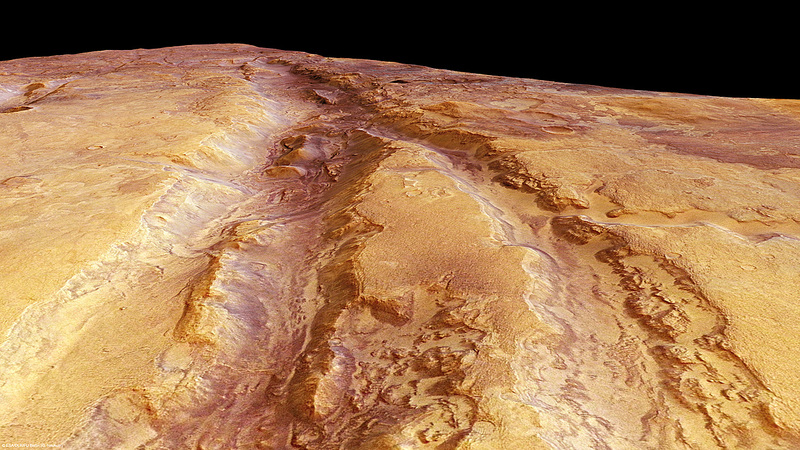 (ESA) Some of the fractures and faults in the Martian crust extend up to 500 meters deep. One of the intriguing things about Nili Fossae lies above the surface. Earth-based telescopes have detected that the atmosphere around Nili Fossae contains an increased amount of methane. This leads scientists to believe that methane may be produced in the area, a theory which the ExoMars Trace Gas Orbiter will attempt to verify if/when it launches. The orbiter is currently expected to launch in 2016, but has suffered numerous setbacks, some of which I detailed in the October article, Russia Looks Set to Become Partner in ExoMars Mission. See All Mars Photo of the Day Posts! NASA Prohibited from Helping Phobos-Grunt?